The International Day for Tolerance is an annual observance declared by UNESCO in 1995 to generate public awareness of the dangers of intolerance. It is observed on 16 November. Here are excerpts from UNESCO’s Declaration of Principles on Tolerance including the complete text of article 1. 1.1 Tolerance is respect, acceptance and appreciation of the rich diversity of our world’s cultures, our forms of expression and ways of being human. It is fostered by knowledge, openness, communication, and freedom of thought, conscience and belief. Tolerance is harmony in difference. It is not only a moral duty, it is also a political and legal requirement. Tolerance, the virtue that makes peace possible, contributes to the replacement of the culture of war by a culture of peace. In order to generate public awareness, emphasize the dangers of intolerance and react with renewed commitment and action in support of tolerance promotion and education. We solemnly proclaim 16 November the annual International Day for Tolerance. As an anthropologist I have made a lifelong commitment to teaching and practicing the principles of tolerance. Food is no exception. My basic rule of thumb is that if someone else enjoys it, I have to try it once. I have discovered so many wonderful foods that way. I raised my son the same way – cardinal rule: “You must try everything once. If you do not like it – fine. But you MUST try it.” As a result he’ll take grilled pig’s stomach over Burger King. I will admit that I have one small limitation – many foods that are soft and slimy cause me problems. Depends on taste though – I adore raw oysters. I struggled with silky tofu as a youth, but conquered it in the end. Sea cucumber (a.k.a. bêche-de-mer), a soft, slippery marine creature, still bothers me. I can manage a small portion heavily doused in a spicy sauce. At least TRY something before you turn your nose up at it. Don’t judge people negatively because they like foods that you don’t. The latter comes about because foods are often used in derisive comments about other cultures. How many times have you heard jokes about cats and Chinese restaurants? Foods so often symbolize prejudice and ethnocentrism. To narrow things down I thought I would focus on foods that have technically rotted, but are, nonetheless delectable to some and not others. All cultures eat some rotten foods. On the great blog Chowhound I found this: “I remember being at a pot luck dinner, where one of the Chinese guests reacted violently to the macaroni and cheese. ‘Why would anyone want to ruin a good dish of noodles with salty, rotten milk?’ “And that was just regular old cheese – what about Stilton or Limburger? Conversely, classic Asian fish sauces and fish pastes are rotted fish which some Westerners have a hard time with. Icelanders wolf down kæstur hákarl, or rotten shark, and Norwegians love lutefisk, aged lye soaked fish which outsiders liken to a weapon of mass destruction. For a recipe I am going to focus on SE Asian shrimp paste which goes by various names – belacan, geragau, rebon . . . I call it blachang which is Javanese, because I do a lot of Javanese recipes. The “shrimp” are actually krill. They are steamed first and after that are mashed into a paste and stored for several months. The fermented shrimp are then prepared, fried and hard-pressed into cakes. Blachang has a very strong rotten fishy smell. You can find it in good Asian markets or online. It is an essential ingredient in many dishes including my favorite soup, soto ayam. Soto ayam just means “chicken soup.” It is found in various forms throughout SE Asia. 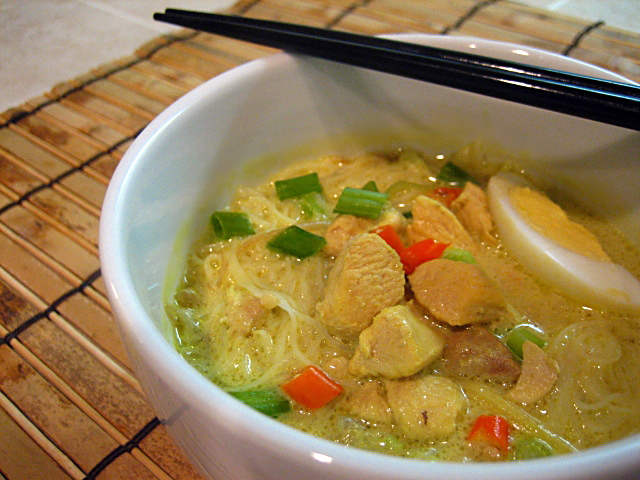 In Java it has a chicken broth base flavored with turmeric, ginger, garlic, and blachang. The blachang is critical. Here’s the recipe from my head. Place a whole chicken in a large soup pot with a diced onion. Cover with water and simmer for an hour or more, until the meat is falling from the bones. Remove the chicken, let it cool a little, and strip the meat from the bones. Heat some butter in a skillet and gently sauté 1 tablespoon of turmeric, 2 cloves of garlic finely diced, ½ tablespoon of finely diced fresh ginger, and a knob of blachang (about ½ tablespoon). I don’t actually ever measure anything – these are approximations. After about 10 minutes add a ladleful of stock and simmer so all the spices are dissolved. Add this mixture to the chicken stock and simmer 20 minutes. Meanwhile cook a large packet of rice noodles, drain, and reserve. Return the chicken to the soup and let it heat through. I often made soto ayam as a party meal for a dozen or more. Guests came to the kitchen, got their soup, and then selected additions from big bowls on the kitchen table, before going to the dining table to eat. It was a great way to bring people together. Perfect for International Day for Tolerance. Eating together brings people together.